The JH Lord Travel Grant provided by Geoconferences assisted my attendance at the Geocongress 2002 in Windhoek, Namibia, 22-26 July 2002, a pre-conference field excursion to the Karibib region, and an informal visit to the Uis region of Namibia. I also acknowledge Curtin University for generous provision of funding toward the cost of my airfare. The six-day pre-conference field trip was a superb opportunity to see a number of excellent examples of gem and rare-metal pegmatite and industrial mineral occurrences in the Central Zone of the Neoproterozoic Damara Orogenic Belt. Particular highlights of this tour were a visit to Rossing uranium mine, the Otjua and Usakos pocket pegmatites, and the Rubicon rare-metal pegmatite. Spectacular examples of druses containing giant quartz crystals and ‘watermelon’ tourmaline were seen at the “Kristalgallerie” in the coastal town of Swakopmund. This field excursion provided me with an opportunity to expand my field knowledge of rare-metal pegmatites to types not readily seen in Western Australia. The informal visit to the Uis area after the conference provided me with a further opportunity to see pegmatites in the field, in this case of the tin and tantalite mineralised variety, which have significantly different characteristics in terms of mineralogy and zonal assemblages to the systems I am studying for my doctoral dissertation. The conference itself was an excellent opportunity to hear talks across many sub-fields within economic geology, spanning five days. As most talks were presented in three concurrent sessions it was unfortunately not possible to attend all talks of interest! I presented an oral paper entitled “Fractionation and tin-tantalum mineralization in the Archean Wodgina pegmatite district, North Pilbara Craton, W.A.” in the session dealing with ore-bearing granites, which was well received. This technical session dealt with the entire spectrum of mineralization related to granitoids and felsic magmatism, as well as granitic pegmatites. These talks covered aspects of this field ranging through textural studies, detailed mineralogy, alteration and fluid studies. I found meeting fellow researchers in my field from around the globe and receiving their feedback an extremely rewarding experience. Comments I received will be invaluable in the preparation of my thesis. 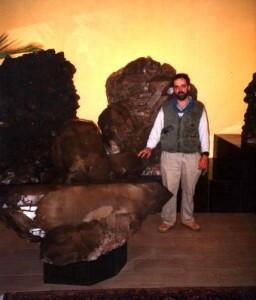 Exposure to the other sessions was also valuable in exposing me in detail to the geology of mineral deposit types and to the geology of the African continent, as well as updating my personal knowledge of the broader field of ore deposit geology. Finally, I had a pleasant stay in Windhoek, the capital of Namibia, and enjoyed the hospitality and spectacular scenery of this beautiful country.